Summer has arrived in the UK and the temperatures are soaring! But what can we do to ensure that we keep our pets safe from the heat? We have put together some tips below on how best to keep your pet safe in the sun whilst still making the most of the beautiful summer weather. 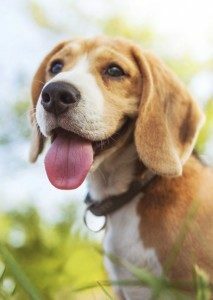 Humans can easily lose excess body heat through sweating; however, dogs manage their body temperature by panting, with saliva evaporating from the tongue. Panting is not normally seen in cats. Cats only pant to cool down as a last resort, so if you notice your cat is panting you should contact your vet immediately for advice. Cats cool down by sweating through their footpads, seeking out rest in the shade and licking their coats to allow the saliva to evaporate and transfer heat away from their bodies. Even so, many cats love lying in the hot sun for hours on end, but they must be able to cool off when they need to. So make sure there is always plenty of shade for them to retire to for a break and unlimited drinking water available. If your pet spends lots of time in the garden during the day, make sure that they can always come back inside or have access to shade. Provide unlimited, fresh, clean drinking water. If you leave the house with your pet, take plenty of water with you and offer it frequently. Avoid exercising your dog in the hottest parts of the day (usually the middle of the day). When out and about with your dog, make sure you stop regularly for them to rest somewhere cool and offer them water. Remember the risk of sun damage to white cats, or cats with pale ear tips and noses. Apply a high-factor sun block as recommended by your veterinary surgeon (a cat-safe product) to those areas every sunny day. 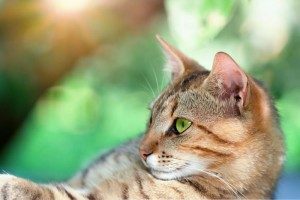 If your cat already has signs of skin damage or is at very high risk your vet may advise you to keep them inside during the hottest part of the day. Speak to your vet for more information. Some dogs with pale fur may be at risk too; again speak to your vet if you are concerned. Episodes of sunburn may increase the risk of certain types of skin cancer developing. Swimming is a great way for dogs to keep cool in warm weather but please don’t let them swim in waters where there is any doubt about the strength of the currents and if they will be unable to climb out easily when necessary. Make sure river water is clear – certain types of algae can be highly toxic to dogs if ingested. Never go into the water yourself to rescue a pet; you could put your own life in danger. Regardless of the weather, the temperature inside a car can very quickly rise to dangerous levels. Never leave your pet unattended in a car. Take extra care with dogs and cats at risk from the heat – short-nosed breeds, older or overweight pets and those with heart problems. If your dog has a thick coat, consider clipping it during the summer months to help them stay cool. Some long-haired cats may benefit from trimming too; your vet will be able to advise what is safest for your cat and least likely to cause them any undue stress. Heat stress is unfortunately a common, life-threatening emergency in pets during warm weather. Early signs may include rapid shallow breathing (panting in cats), unsteadiness, anxiety, dry gums and vomiting. If you are concerned your dog or cat is overheated contact a vet for advice straight away, provide drinking water and dampen the coat and paws (if tolerated and safe for you to do so) with cold compresses. Don’t forget, your vet can also supply you with ROYAL CANIN® Rehydration Support sachets, which are formulated to replace lost fluids and electrolytes in cats and dogs at risk of mild dehydration. This information is intended as general advice only. Please contact your vet to discuss your own pet’s specific health and care needs. © ROYAL CANIN® SAS 2017. All rights reserved.